How are FICO® cores different? What is left out of FICO® Scores? What are the minimum requirements to calculate a FICO® Score? How can FICO® Scores help me? Do I have more than one FICO® Score? Why is my FICO® Score different than other scores I have seen? FICO®, formerly known as Fair Isaac Corporation, is the company that invented FICO® Scores. Starting in the 1950s, FICO sparked a revolution in credit risk assessment by pioneering credit risk scoring for credit grantors. This new approach to measuring risk enabled banks, retailers and other businesses to improve their performance and to expand consumers’ access to credit. Today, FICO® Scores are widely recognized as the industry standard for measuring credit risk. It is important to note that while FICO works with the consumer reporting agencies to provide your FICO® Scores, it does not have access to or store any of your personal data or determine the accuracy of the information in your credit file. FICO® Scores are the most widely used credit scores. Each FICO® Score is a three-digit number calculated from the data on your credit reports at the three major consumer reporting agencies—Experian, TransUnion and Equifax. Your FICO® Scores predict how likely you are to pay back a credit obligation as agreed. Lenders use FICO® Scores to help them quickly, consistently and objectively evaluate potential borrowers’ credit risk. How are FICO® Scores different? Not all credit scores are FICO® Scores. Because FICO® Scores are the credit scores most widely used by lenders—FICO® Scores are used in over 90% of U.S. credit lending decisions1—knowing your FICO® Scores is the best way to understand how potential lenders could evaluate your credit risk when you apply for a loan or credit. Other credit scores, which use scoring formulas different from FICO’s, may not give you an accurate representation of the scores your lender uses when assessing your credit profile. Credit utilization is one of the most important factors evaluated in this category, considers the amount you owe compared to how much credit you have available. While lenders determine how much credit they are willing to provide, you control how much you use. FICO’s research shows that people using a high percentage of their available credit limits are more likely to have trouble making some payments now or in the near future, compared to people using a lower level of available credit. FICO® Scores ignore auto, mortgage, and student loan inquiries made in the 30 days prior to scoring, so the inquiries won’t affect the scores of consumers who apply for a loan within 30 days. What kinds of credit accounts are on the credit report? Whether there is experience with both revolving and installment accounts, or has the credit experience been limited to only one type? FICO® Scores generally range from 300 to 850, where higher scores demonstrate lower credit risk and lower scores demonstrate higher credit risk (note: some types of FICO® Scores have a slightly broader range). What’s considered a “good” FICO® Score varies, since each lender has its own standards for approving credit applications, based on the level of risk it finds acceptable. So one lender may offer its lowest interest rates to people with FICO® Scores above 730, while another may only offer it to people with FICO® Scores above 760. The chart below provides a breakdown of ranges for FICO® Scores found across the U.S. consumer population. Again, each lender has its own credit risk standards, but this chart can serve as a general guide of what a FICO® Score represents. Score factors are delivered with a consumer’s FICO® Score, these are the top areas that affected that consumer’s FICO® Scores. The order in which the score factors are listed is important. The first factor indicates the area that most affected the score and the second factor is the next most significant influence. Addressing these factors can benefit the score. A FICO® Score gives lenders a fast, objective and consistent estimate of your credit risk. Before the use of credit scoring, the credit granting process could be slow, inconsistent and unfairly biased. Keep in mind that FICO® Scores are only one of many factors lenders consider when making a credit decision. Here’s how FICO® Scores may benefit you. Get credit faster - FICO® Scores can be delivered almost instantaneously, helping lenders speed up credit card and loan approvals. Unbiased credit decisions - Factors such as your gender, race, religion, nationality and marital status are not considered by FICO® Scores. When a lender uses your FICO® Score, they’re getting an evaluation of your credit history that is fair and objective. May save you money - A higher FICO® Score can help you qualify for better rates from lenders—generally, the higher your score, the lower your interest rate and payments. More credit available - Because FICO® Scores allow lenders to more accurately associate risk levels with individual borrowers, they allow lenders to offer different prices to different borrowers. Rather than making strictly “yes-no” credit decisions and offering “one-size-fits-all” credit products, lenders use FICO® Scores to approve consumers who might have been declined credit in the past. Lenders are even able to provide higher-risk borrowers with credit that they are more likely to be able to manage. 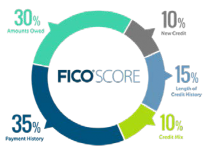 To keep up with consumer trends and the evolving needs of lenders, FICO periodically updates its scoring model, resulting in new FICO® Score versions being released to market every few years. Additionally, different lenders use different versions of FICO® Scores when evaluating your credit. Auto lenders, for instance, often use FICO® Auto Scores, an industry-specific FICO® Score version that’s been tailored to their needs. There are many different credit scores available to consumers and lenders. FICO® Scores are the credit scores used by most lenders, and different lenders may use different versions of FICO® Scores. In addition, FICO® Scores are based on credit file data from a consumer reporting agency, so differences in your credit files may create differences in your FICO® Scores. There are many reasons why a score may change. FICO® Scores are calculated each time they are requested, taking into consideration the information that is in your credit file from a consumer reporting agency at that time. So, as the information in your credit file at that CRA changes, FICO® Scores can also change. Review your key score factors, which explain what factors from your credit report most affected a score. Comparing key score factors from the two different time periods can help identify causes for a change in a FICO® Score. Keep in mind that certain events such as delinquent payments or bankruptcy can lower FICO® Scores quickly.